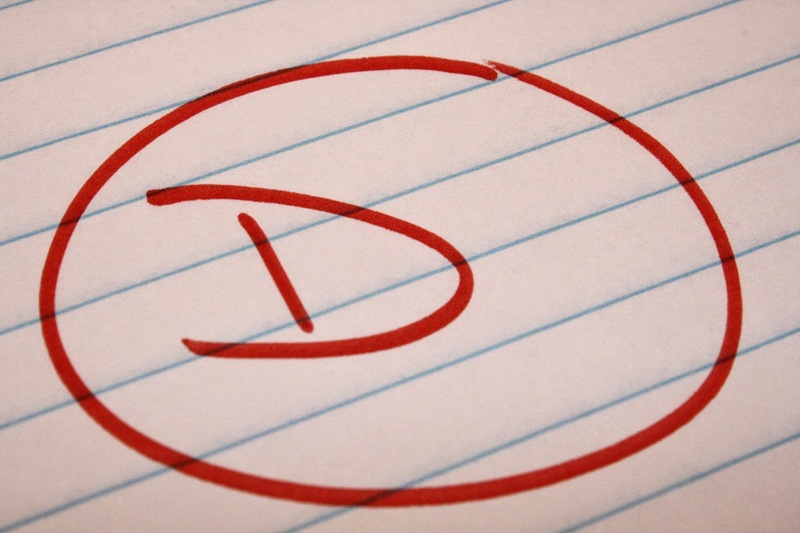 How do you grade a school? See for yourself. Yesterday morning, a friend texted me following a tour of our assigned middle school. Our oldest kids are slated to go there after next school year -- she's planning ahead, visiting magnet schools as well as our base school. After her visit, my friend happily talked about "the spirit" of the school and how the students were "so proud and so excited." When's the last time you saw middle schoolers excited about school? That sense of community, combined with a growing engineering program, connections with NC State and enthusiastic teachers is what won her over. This morning, the newspaper ran a full-page listing of the letter grades assigned yesterday to all public schools in North Carolina for the first time. According to that report, this same school is a D.
I'm betting on the assessment made after actually going to the school, hearing from the students and talking to the teachers. That barely passing grade from the state is calculated using only last year's scores on end-of-grade reading and math tests (80%) and a small measure of student academic growth (20%) -- it doesn't come close to capturing the full picture of what students and teachers are accomplishing in the school, where more than half the population lives in poverty. Berger seems to think that it's the grades that will change the schools, not leadership development, instructional supports or professional salaries for teachers. Despite Berger's allegation, no one believes that "high poverty schools are incapable" -- but decades of research and observation tell us that poverty creates challenges and obstacles to effective teaching and learning that have to be overcome. Slapping a letter grade on a school won't change that. Rep. Craig Horn (R), chairman of the House K-12 education committee, acknowledges that the formula might need to be adjusted, but says the letter grades are easy for parents to understand. "At least A, B, C, D and F, people have a much more definitive idea of how that school is performing and will make judgments accordingly," Horn said (WRAL). It's exactly those "judgements" that scare me. When parents see a D or F assigned to a school, it will be easy to remove that school from the consideration set. But when parents make decisions about whether or not to send their children to a certain school based only on that letter grade, they could be missing out on a great school. That decision can quickly turn into a vicious cycle for the school, where reputation becomes reality as more parents with the means to make different choices opt out of the school. That's not what I want for any school -- but especially not for the school my son is likely to attend in another year, a school that has worked hard to become a popular choice after spending years rumored as a school to avoid. I don't expect to see changes to the law any time soon -- Sen. Tillman acknowledged as much, and Sen. Berger is far too pleased with the law as it stands. What I hope, though, is that parents and community members won't judge schools by this law. I hope that they will take the time to walk into these schools and judge for themselves. Look for the good teaching and good leadership that Sen. Tillman referenced. Get a sense of the community in the school, watch how students interact with each other and with their teachers. The feeling you have inside the school will tell you far more than any letter grade -- regardless of what that letter happens to be.